Michael: Greetings, Piotr! Tell us how got into the wonderful world of video game music. What games have you worked on so far? Piotr Koczewski: Priviet! In 2005 I sent in my “old” demo for a project called Burgeoise RPG (now Afterfall). I did not get the job, but I learnt a lot of things during that enterprise, which was for my own good. Frankly speaking, if it had not been for that defeat, I would not have learnt to create the music the way I do it now. Later on I took part in a few amateur projects, which were published after some time (for example Implosion). Nevertheless, the milestone of my career was Spellarena, which paved my way to further composition gigs. That was when I could start calling myself a “game developer”. Michael: When and why did you decide to write music? What groups / composers influenced you most? Maybe you can recall some of your childhood moments related to music for our readers? Piotr Koczewski: I began to create music more or less in the years 2005/2006. That activity soon became my job, because many people started to encourage me to do more of this (this is where the Wasteland Theme album originated from). I have always said that creating music is my genuine passion. I have never attended a musical school, I have only listened to music. Currently I am most inspired by Hans Zimmer, Lorne Balfe, Tom Salta and Harry Gregson-Wiliams. When I was a child, I liked the Crimson Tide and The Rock film music - and not to mention what I felt when I heard the music from Fallout 2 on one summer day in 1999. Michael: What's the very first thing you do when you start writing a new piece? Could you give us an estimate of how much time you spend on average to create a single composition? Piotr Koczewski: At the beginning I read the plot of the game, look at the draft sketches, artwork and screens. I create the melody in my head and improvise at the keyboard, writing even 3-5 different themes per day. I still remember the 90s, when a lot more time was spent on mixing in order to achieve the desired effect, and the records from that time are still worth listening to now. I try to create outstanding pieces, hence on average it takes me 3 days before I consider a piece complete. I do it this way, because I want my music to be considered good in 10 years as well. Michael: What hard- and software do you use in your studio? Piotr Koczewski: In my home studio, I use, first of all, EWQLSO and Project SAM Symphobia (I really recommend it, because it is worth every penny spent on it). Other components include a Maya44 sound card, Technics SA-AX720 amplifier, Altus Tonsil 300 stage monitors, MDR XD-300 headphones and the M-Audio 61 ES MIDI keyboard. As far as the computer is concerned, I use Windows XP 64-bit with 64-bit Cubase 5 and A Intel 2.5 GHz dual core processor with 4 GB RAM. I admit I am planning to get better equipment. Intro - "Flight of the Angel of Doom"
Michael: What has been the most difficult project for you so far? For which game did you write the biggest amount of music? Piotr Koczewski: Storm over the Pacific - almost hour of World War 2 music. Michael: How much time did you spend on Wasteland Theme and Wasteland Theme 2? Piotr Koczewski: Wasteland Theme was two years (I spent one year making the music and one year on waiting and talking to the label). Wasteland Theme 2 – I spent 6 months working on it, alongside Storm over the Pacific and others. Just as an interesting bit of information – I spent two months of that time working on The Modern Warfare. Michael: Can you tell us why you moved from the dark ambient style of Wasteland Theme to the rhythmic and destructive electronica of Wasteland Theme 2? Piotr Koczewski: Why did I change my style? Well, I wanted to do something new and acquire new skills. I still cannot believe I created my own music style with The Modern Warfare. 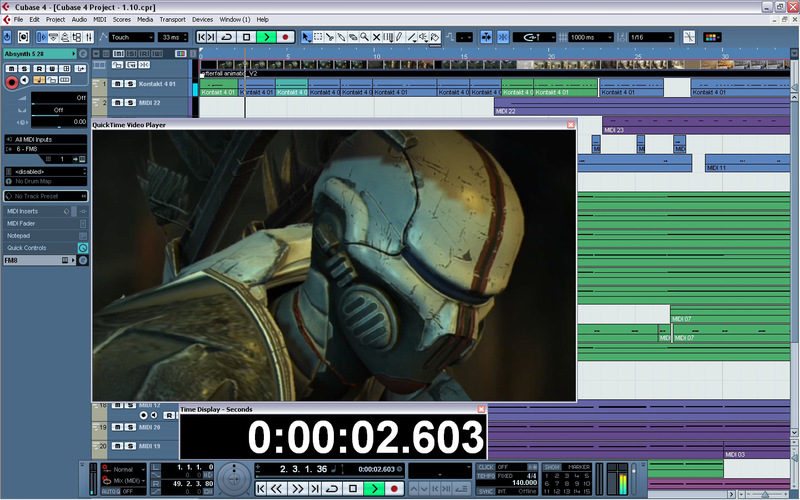 In these days, AAA-composers write dynamic trailer music and if you don`t want to be left behind, you have to remain up-to-date as far as industry standards are concerned. Michael: It looks like people were not that interested in Wasteland Theme. Do you think that the commercial release of the soundtrack album was a mistake? What do you think of services like Bandcamp, where artists can upload their album, set its price, choose the format (including lossless), and make music free to download or at a price of their choosing? Piotr Koczewski: I both agree and disagree, because Wasteland Theme was available for free on Soundclick. Another thing is that Wasteland Theme was an ambient and dark electronic album. Not many people listen to this kind of music. I think that the album was played approximately 15,000 times on various websites. That album was actually a promotional one (music from it was used in a few games). Not many people buy an album if they had a chance to listen to it for free. Now Wasteland Theme 2 is available on iTunes and Amazon, as well as at other online stores. I had intended to keep working on the album until it was ready and worth its price. Some customers pre-ordered Wasteland Theme 2 at CD Baby, which made me really happy. As far as Bandcamp is concerned, I would like to share a little secret with you. Making an album available for free listening is only beneficial to bands that play concerts. Due to this marketing trick, you see a lot of CDs uploaded to MySpace, where you may listen to them before the artist's concert. The .wav format can be substituted with the .mp3 format at a bit rate of 320 kbps. Michael: We've heard that Polish and Czech game developers face a similar problem to their Russian and Ukrainian counterparts: AAA projects are hard to come by and the small size of the national game industry can limit opportunities for artists. Is it correct that there are only a few game sound professionals working in your country? Piotr Koczewski: It sometimes seems to me that some people in this industry are only in it for the money, not to create anything ambitious or breath-taking (an exception is the work of Hans Zimmer and Lorne Balfe on Modern Warfare 2). Well, to some extent this is the right approach. I know a few really talented musicians who would compose outstanding music, if it wasn't for the place already occupied in the studio by other professionals. This is the reason why there are so few of us. Michael: If you had the opportunity to raise the bar for games and their music, how would you achieve this? Do you have game conferences in your country? Piotr Koczewski: I know the Instytut Rozbitek (Cast Away Institute) by Jan A. P. Kaczmarek, but that's film music. As far as game development is concerned, we have a new series of gatherings called Zlot Tworców Gier Komputerowych (Computer Games Developers Gathering). The annual event takes place in the centre of Poland and is called Computer Games Engineering. The other venue is the Silesia voivodeship during the Game Day event. I recommend distributing your own albums during such events, rather than your business cards. In my opinion, the best way to improve your skills is the exchange of knowledge, and also supporting your friends from the demo scene. Michael: Do you know any Polish websites that focus on game sound and target professional developers, sound directors and composers? Piotr Koczewski: The only game sound websites I know are VGMDB.net and mobygames.com. Michael: Have you started thinking about the concept of your new solo album and about its title? Piotr Koczewski: I have some ideas about how I am going to end the Wasteland Theme trilogy. I am planning to make my own trailer music soundtrack, similar to projects like Audiomachine, X-Ray Dog, Epic Score, Immediate Music and Two Steps from Hell. Michael: What recent game music albums have you enjoyed? Piotr Koczewski: Command & Conquer: Red Alert 3, Call of Duty: Modern Warfare 2 and Metal Gear Solid 4: Guns of the Patriots. Michael: Which recent videogames did you enjoy from your perspective as a composer and sound designer? Any noteworthy Polish releases? Piotr Koczewski: I like Arkadiusz Reikowski’s soundtrack for Sadness (available as a free download). Regarding sound design, I've learnt a lot by playing the Tom Clancy's Hawx games and Call of Duty: Modern Warfare 2. Many Polish video game musicians expect to work solely on games. They forget to refine their skills by recording their own albums. I did the same thing as Tom Salta did with his solo album Atlas Plug. He said that there are no creative limitations when you're making your own music, therefore the sky is the limit. In my opinion, video game music should be timeless, and not just another temporary creation, like film music. I would like to add that game industry sales beat those of the film industry. Michael: What musicians (composers or maybe vocalists) would you like to work with? Piotr Koczewski: When I was creating the music for the Afterfall Insanity trailer, I was planning to hire a vocalist. I ended up not having the time do that, because I was supposed to work on the gameplay music (someone else was in charge of the music for the game itself). Maybe one day I will record music with an orchestra, controlling the recording process remotely. Michael: You've worked with Russian developers on Fallout Online and Krai Mira. Are there any new offers from Russia or the Ukraine? In general, what are you looking for when you choose a project? Genre, setting, something else? Piotr Koczewski: That is right. I am busy working on Krai Mira, because I also work on this project as the Marketing and Public Relations Manager. I also give my advice to the Postworld team. These guys are just great! What surprised me most was that they wanted my music at any price. I created a few ambient pieces for them, including the main theme, and you can expect to hear the gameplay music in the released beta version. As far as that soundtrack is concerned, it will be different from any other, because this is a post-apocalyptic world with its own rules. Talking about Krai Mira, I was able to include my own ideas there, for example each character in this game will have an individual motif ascribed to them, a Leitmotif. Sincerely, I would be able to write music for every game as long as it has a good plot - excluding casual games (they're good fun only for five minutes). Michael: Your main theme for Postworld sound unusual and fresh, with its mix of industrial and Western elements. Can you tell us more about this project? What other games are you working on at the moment? What genres or styles would you like to work in? Piotr Koczewski: The project started out as a Crysis mod and our intention was to recreate the original Fallout experience using the CE2 engine, and the mod's name was going to be Fallout: Rebirth. As time went by, we started drifting away from our original goal, because we felt that there were so many new and interesting ideas in our mod that would dramatically alter the player's experience. There was also a bit of tension within the team - some people thought that making use of a classic game like Fallout was wrong, while others thought it would be an easier solution, compared to coming up with something new. The fact that Bethesda wasn't too fond of our idea did not help... well, we do not blame them. In the end we just trashed all our original plans, switched to the Unity game engine and set ourselves a new target. That was how Postworld came about. For about a year we familiarised ourselves with the Unity engine and earlier this year, we decided it was the rightengine for us... Then we pre-purchased the Pro license for Unity 3, which is due for release later this year. We are planning to release our first tech demo later this year. It will showcase some of the usual RPG features, such as dialogues, player character control, NPC interaction etc. It will also feature a few level maps from one of the locations we want to include in the final game. It is possible that Postworld will be released for iPhone, iPod and other mobile platforms. I do not want to spoil anything by elaborating on any further projects, and apart from that, I am bound by NDA contracts. In my spare time, I write articles for shockwave-sound.com and 1soundfx.com. I would really like to create music for FPS and RPG games that have a post-apocalyptic atmosphere and are similar to Modern Warfare / Battlefield: Bad Company 2. Michael: Do you plan to start your own label? How difficult is it to negotiate with Polish game developers to let them allow you to release your soundtracks? Piotr Koczewski: I am going to start Piotr Koczewski Records soon. As a composer, I have no problems releasing the music from the games whose creation I contributed to. Michael: Looking into the future, how do you think the game music industry will develop? Will there be a place for lone freelancers or will large music studios play the leading role? Piotr Koczewski: There will be more independent game creators, working remotely in studios and doing a fantastic job, comparable to the work done in the studios that create the AAA games. Recently the number of recording studios has increased. You can hire the orchestra musicians to work remotely, so that even freelancers may hire the entire orchestra for the purpose of recording a soundtrack, like Jesper Kyd (if the budget allows for this, of course). Michael: Any advice that you could give to aspiring composers? Piotr Koczewski: It does not matter what level you're at. Listen to music every day. After some time you will learn to program virtual instruments on your own. Personally, even if I had to quit working on music for video games, I would still treat the very creation of music as a hobby. Michael: And now you've got the chance to say some words to all Russian people! Piotr Koczewski: I greet all my Russian fans! I am very glad to hear that my music is popular in Russia. By the way – I wrote two special pieces including elements characteristic for Russian culture - "The Red Army" and "Kremlin" for Storm Over The Pacific, released by Matrix Games . I also composed “Spetsnaz” for Wasteland Theme 2 - part of the piece was played on the balalaika.